So we all have some sort of brainless-vice that we turn to when we want to zone out from the real world. For some people, it's watching some screaming "real" housewives, others prefer funny comedies or sitcoms. Me? 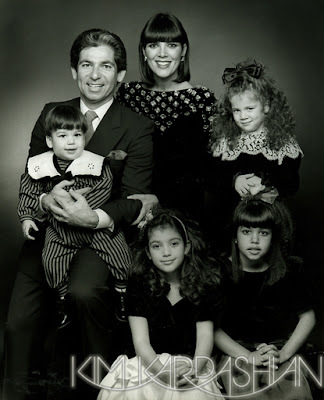 I am hook - line - sinker addicted to Keeping Up With the Kardashians. Don't even begin to tease me about how fluffy this show is. I am aware. The same goes for the spin-off shows, "Kourtney and Khloe Take Miami" and the upcoming "Kourtney and Kim Take New York." They are equally zero content. I know. But it's just something about the dynamic these shows portray with this His, Hers, and Ours massive family. A bajillion socialite children, their grounded Olympian Dad, and their attention-seeking momma. They are ridiculous. They go out for meals and have papparazzi surrounding the restaurant. They have odd monotone voices, ginormous wardrobes and ballistic boyfriends. They get married to other celebs months after meeting them. They wear 4-inch heels while lounging around each of their million-dollar homes, all in the same suburban neighborhood of LA. And oh my gosh guys, they have their own websites. They detail out what they are wearing in every picture they post. They blog about the party circuit and trips they are taking. They parade around with their kids on their hips as they hit the town. I just can't explain it. I. Am. Addicted. So, so, so ridiculous. I love them too. And they are SO ridiculous!